While awaiting trial for the alleged murder of an East Chicago policeman, the police boasted to area newspapers that the jail was escape-proof and posted extra guards to make sure Dillinger couldn’t escape. 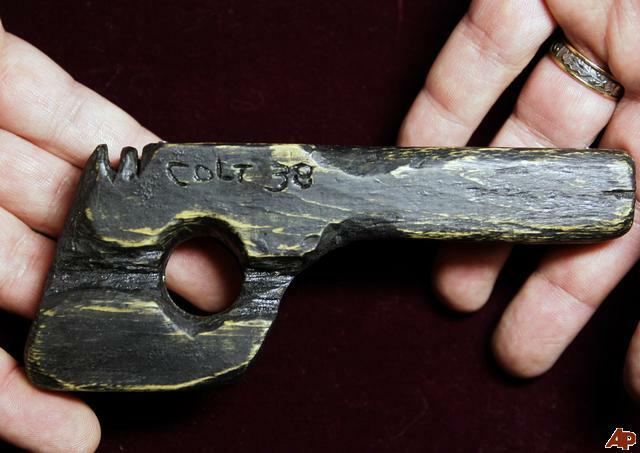 Dillinger was able to secretly carve a wooden gun (pictured) from the top of a wooden washboard and coat it with black shoe polish. Using it, he was able to trick a guard into opening his cell. He then took two men hostage, rounded up all the guards in the jail, locked them in his cell, and fled. Dillinger stole Sheriff Lillian Holley’s new Ford car, embarrassing her and the town, and traveled to Chicago. No, it does not fire. It was made from the top of a washboard and was used AS a pistol, if a piece of wood fired a .45 cal round, it would explode.